Winners of Northwestern University’s First Annual Global Health Case Competition include (left to right) Grace Jaworski, Suvai Gunasekaran, Smitha Sarma, Emily Drewry and Pooja Garg. 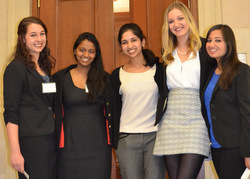 The interdisciplinary team will compete at the Emory University International Global Heath Case Competition in March. This weekend, 11 Feinberg students participated in Northwestern University’s First Annual Global Health Case Competition. After competing in a global health case competition at Emory University last year, Kate Klein, an MPH student and assistant director of the Program of African Studies, decided to organize an intermural competition at Northwestern. Eight teams comprised of 40 graduate and undergraduate students from different schools at the University competed in the event. The teams were given a global health issue five days before the event that they were to “solve.” The day before the competition, teams met with assigned mentors who gave feedback and advice on their plan. Teams presented solutions to a panel of judges on Saturday. “This competition brings students together to work on global health projects. The interdisciplinary aspect to this event makes it unique. Each student brings something different to the group, making for stronger teams than if they faced these challenges with members from the same school,” said Robert Murphy, MD, director of the Center for Global Health. The competition also featured keynote speaker Megan Rhodes, deputy chief of the U.S. Agency for International Development (USAID) Maternal and Child Health Division, where she helps to lead a team of 34 people who support USAID’s goal of ending preventable child and maternal deaths. 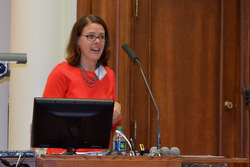 Megan Rhodes, deputy chief of the U.S. Agency for International Development (USAID) Maternal and Child Health Division, gave the keynote lecture at the event. She said that global health problems require the expertise of many disciplines, and that Northwestern’s competition reflected this reality. Rhodes was with USAID in Uganda from 2009-2012, where she led health efforts in maternal child health, malaria, tuberculosis, family planning and neglected tropical diseases. This year’s case was about childhood pneumonia in Uganda, mimicking problems that Rhodes encountered during her time there. The winning team was comprised of first-year medical students Suvai Gunasekaran and Smitha Sarma, Emily Drewry from the Medill School of Journalism, Media, Integrated Marketing Communications, and Grace Jaworski and Pooja Garg from the Weinberg College of Arts and Sciences. They will compete at the Emory University International Global Heath Case Competition, a yearly event bringing together teams from more than 30 universities from around the world, and received $1,000. The second place winners were third-year MD/MPH students Chelsea Williams, Ashley Ceniceros and Adina Goldberger, Joshua Altman from the Kellogg School of Management and Alessandro Culotti from The Graduate School. They received $600. The competition was sponsored by the Center for Global Health, International Program Development/Global Health Studies, Global Engagement Summer Institute, the Buffett Center for International and Comparative Studies and the Program of African Studies.